Black and grays, for a 3/4 arm (shoulder to half forearm). This is a sample of a japanese tattoo made by me with an Asian dragon as main element for a 3/4 sleeve . Floating in a background of negative spaces, waves, flames, clouds and cherry flowers. HOW TO GET A CUSTOM TATTOO LIKE THIS? 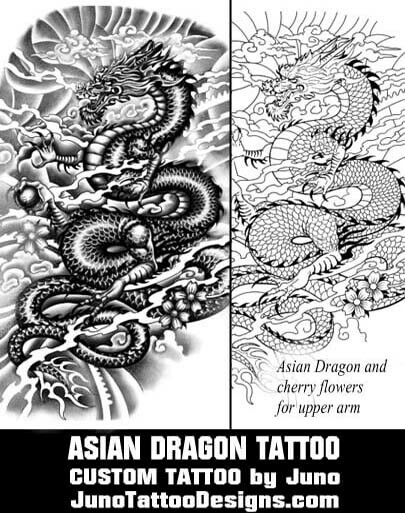 1) Send me a contact form and tell me your ideas about the custom dragon tattoo that you want. 2) After the initial payment of $170 we will work together draft by draft until the design looks as you wish. 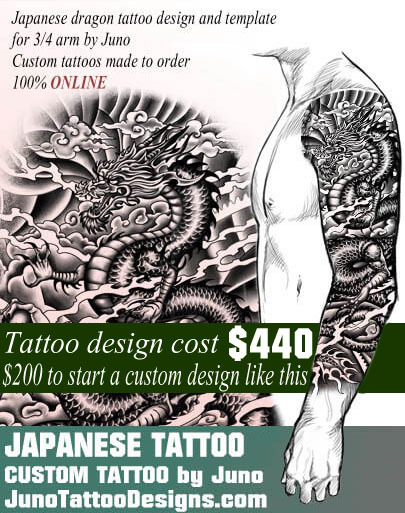 4) You make the final payment of $170 for the finished design in high resolution and the tattoo stencil. 5) I’ll send to your email account your custom tattoo design and stencil ready to do your dreamed tattoo in any tattoo shop of your area. Why I should make an initial payment to start the drafts? Fortunately, I receive a lot of request by week and I cannot start a tattoo design for free for each potential customer. Thanks for your understanding! Is this a secure purchase? Is my personal information protected? All purchases are handled through a secure PayPal transaction. No sensitive information is exchanged on my site, or outside of PayPal. How we will work in the tattoo design? We work by email. I have made thousands of tattoo designs 100% online since 2010 for people of USA, Canada, Brazil, France, Italy, Spain, Australia, Norway, Filipines,New Zealand, Mexico and many others. Hit the design concept with the first sketch. quick turn around on suggestions for design updates. Final design was better than what i pictured in my head. highly recommend this artist. I was honestly a little nervous as I have never used a service like this before, but I loved the art I saw from Juno. I took the chance and couldn't be happier. After 3 drafts with minor revisions, (enlarging a turtle, adding symbols for my family, etc); after about 2 week's total my tattoo is complete and it is better than I ever imagined! It is amazing, a full back piece that accounts for my existing tattoos and styles. I was honestly a little nervous as I have never used a service like this before, but I loved the art I saw from Juno. I took the chance and couldn't be happier. After 3 drafts with minor revisions, (enlarging a turtle, adding symbols for my family, etc); after about 2 week's total my tattoo is complete and it is better than I ever imagined! It is amazing, a full back piece that accounts for my existing tattoos and styles. Juno was awesome and worth the time/money. I am excited to get this piece tattooed so we can work in the next one.